A rising literary star debuts with 12 wry, poignant stories of love, hope, and transformation. In "Some People Must Really Fall in Love", an assistant professor takes halting steps into the awkward, adult world of office politics and blind dates while harboring feelings for one of her freshman students. Two grown sisters struggle with old assumptions about each other as they stumble to build a new relationship in "A Map of Modern Palm Springs." Rome is the setting of "Puttanesca", as two young widows move tentatively forward, still surrounded by ghosts and disappointments from the past. These 12 stories, filled with the sharp humor, emotional acuity, and joyful language that are sure to become Straub's hallmarks, announce the arrival of a major new talent. This might be entertaining for someone who is interested in a light, shallow, empty story. It's actually a series of stories, but each one is worse than the last. No depth. Not even interesting. 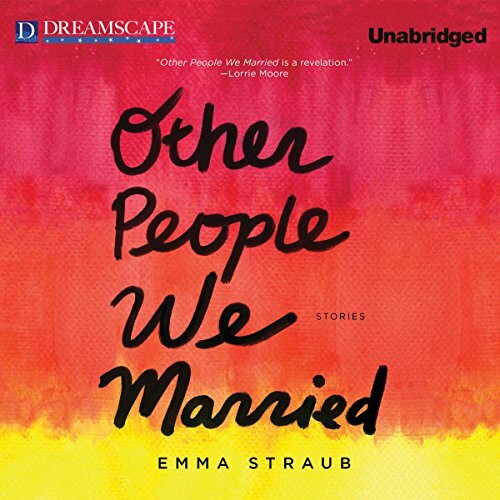 Would you ever listen to anything by Emma Straub again? There's a reason I don't read fiction unless it's considered a classic. This is the kind of book that reminds me why I don't read fiction. Truth is, by far, much more interesting. I experimented with this one based on its recommendation in the local Book Review. What a disappointment! What didn’t you like about Coleen Marlo’s performance? This is the worst part of the book. Ms. Marlo's voice with it's superior attitude drove me straight up the wall. Sometimes I can get thru something I wouldn't normally read by listening to it. This one was impossible. I stopped it after the 2nd story. What character would you cut from Other People We Married?